Curia Studios is my current musical home where all new material is born and honed. I often hold writing sessions in one of the rooms known as "The Library". This room sports a comfy couch, all of my research books (yes, I still use books) and an old Hammond organ which I play around with from time to time. The Library Room is generally a nice area to brainstorm new material. It's also a great space to record acoustic instruments, guitar cabinets, etc. Adjacent to The Library is an equipment room which stores different instruments, cabling, microphones, stands and the like. 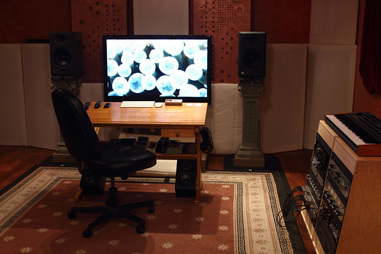 The next room over is the studio control and main recording room. As you might have guessed, all the technical operation of the studio hail from here. Sometimes, the entire production of a song (writing, arranging, recording, mixing and mastering) starts and finishes at Curia Studios. Of course, I very much enjoy recording at Wavelength Studio when I'm able and also use Atomic Mastering and Airshow Mastering occasionally.